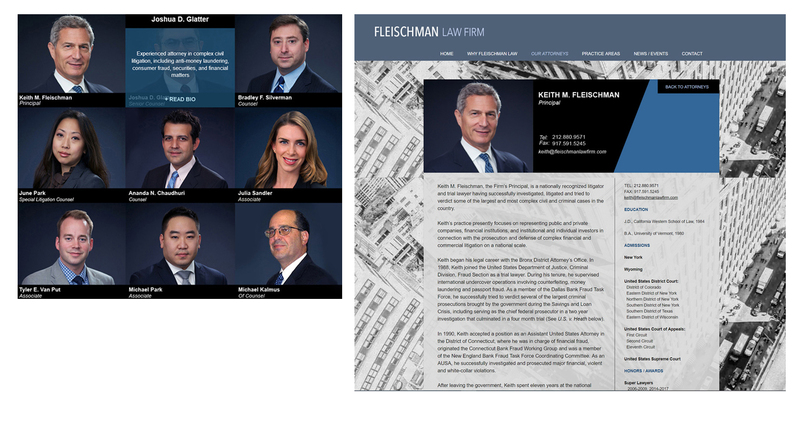 The Fleischman Law Firm is a 10 attorney, elite firm in midtown Manhattan founded by acclaimed prosecutor and private-sector litigator, Keith Fleischman. The firm takes on highly complex, high-stakes litigation involving SEC investigations, corporate shareholder suits, hedge fund and private equity transactions, and labor and employment disputes. 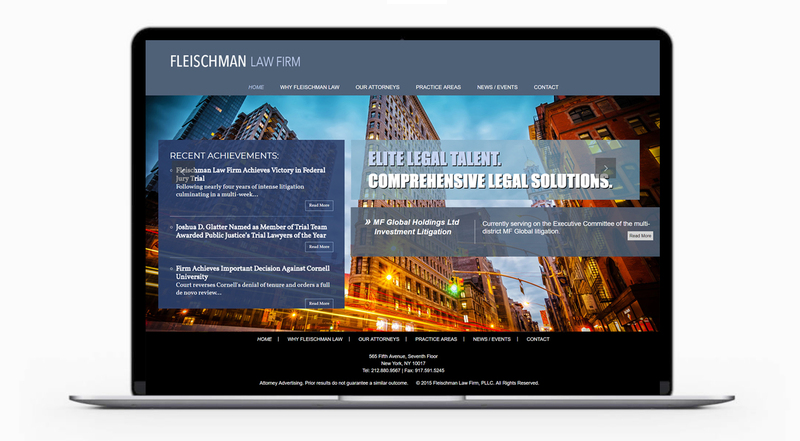 We reworked Fleischman Law Firm’s old-fashioned and outdated website into a brand new, full-screen WordPress site, with the following key features: (1) homepage with a slider which rotates images and recent case victories, and an additional “Recent Achievements” feed; (2) separate listing page for all attorneys with high-resolution photos; (3) detailed attorney bio pages; and (4) news & events pages. 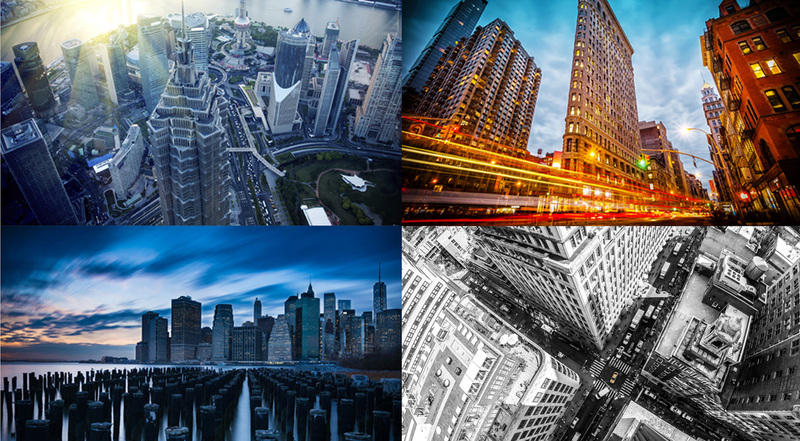 Design-wise, the photographs we used were chosen not only for overall visual impact, but for the unique vantage points and city views they depicted. This reinforced the theme that this elite firm analyzes its cases, no matter how simple, from a “high above” and unique perspective. 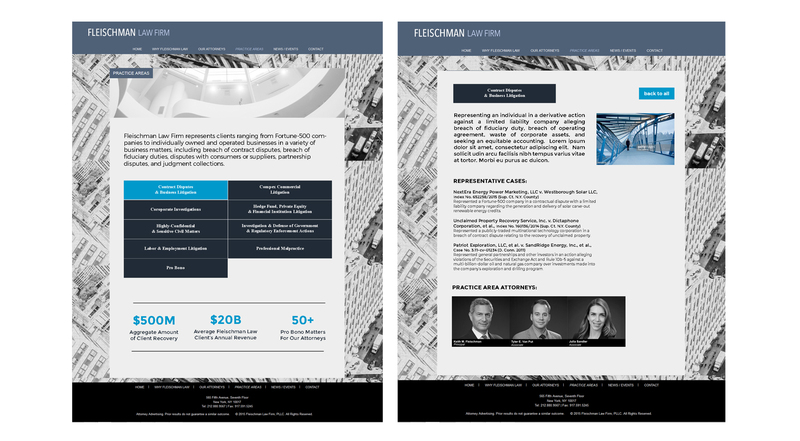 The inner pages of the site continue to highlight and reinforce the theme of Fleischman’s elite talent and unique perspective. Banners on each page repeat the appealing photos which are rotated on the site’s homepage. Content on each page is centered and overlaid on top of a black & white image of NYC buildings from above. A news & events page on the site further showcases the firm’s recent victories, highlights, and recently garnered press. 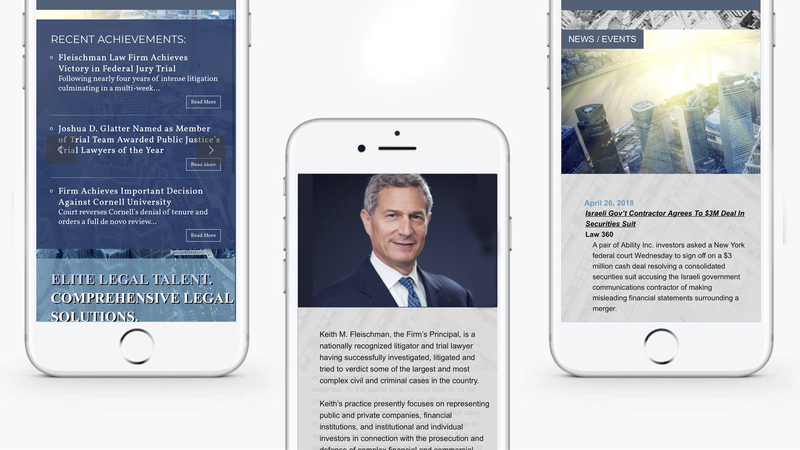 Finally, a redesign of the practice areas page is planned to show a further, more detailed breakdown of the firm’s well-defined practice areas, with a summary of recent legal cases won and specific attorneys who work in each practice area.